The postmortem of popular Bollywood actress, Pratyusha Banerjee, who was found dead in her Mumbai house this week, has been completed. The actress' body was taken to the Oshiwara Crematorium directly from the hospital and was cremated in the presence of friends and family. A team of doctors conducted the post-mortem for over three hours and the entire procedure has been videographed. The viscera samples have been sent for forensic analysis even as the final autopsy report is expected later. Though officials declined to comment, a tattoo bearing the name 'Rahul' - purportedly referring to her boyfriend, Rahul Raj Singh - was found on her upper back. 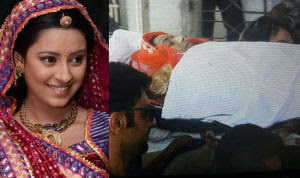 Postmortem examination of Pratyusha Banerjee's body reveals 'suffocation' as cause of death. The report says it's a 'clear case of suicide' and there's no foul play, however it cannot be completely ruled out as well, reports ANI. The report also mentions 'asphyxia' and says ligature marks were also seen around the neck.